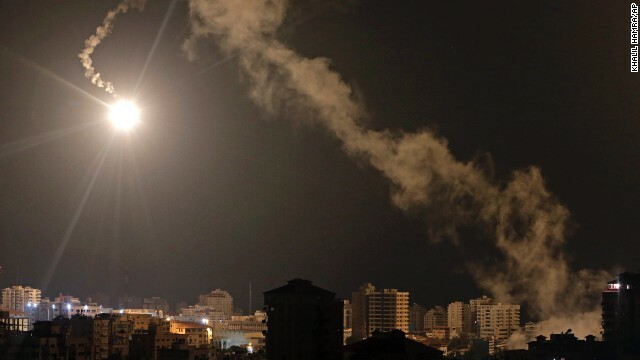 An Israeli flare lights up the night sky of Gaza City as the three-week-old conflict continues. Middle East fighting intensifies. The U.S. accuses Russia of a missile treaty violation. And a California judge says the sale of the L.A. Clippers can move forward. Accused of violations: The United States has accused Russia of violating the 1987 Intermediate-Range Nuclear Forces Treaty, citing cruise missile tests that date to 2008, senior State Department and White House officials said. "This is a very serious matter which we have attempted to address with Russia for some time now," a senior State Department official said yesterday. President Barack Obama has written his Russian counterpart Vladimir Putin a letter about the matter. Fighting blocks way: International investigators and observers were again prevented from reaching the crash site of Malaysia Airlines Flight 17 Tuesday by fierce fighting in the area between pro-Russian rebels and Ukrainian forces. The 50-person team of Dutch and Australian experts, accompanied by monitors from the Organization for Security and Co-operation in Europe, was also forced to abandon its attempts to reach the site Sunday and Monday. Killer disease: Two American health care workers are among those infected with Ebola in Western Africa. Both are receiving treatment. Health officials in the region are having a tough time getting a handle on the outbreak. Liberia has closed its border to try to suppress it. As of July 20, the World Health Organization had confirmed 224 cases of Ebola in Liberia, including 127 deaths. Overall, Ebola has killed at least 660 people in West Africa. There were 45 new cases reported in the region between July 18 and July 20. Roadblock removed: A California probate judge has ruled that a deal to sell the Los Angeles Clippers NBA team for a league-record price of $2 billion can move forward. Judge Michael Levanas tentatively ruled in favor of Shelly Sterling, saying the estranged wife of Donald Sterling acted properly in removing her husband from the trust that owns the team. Donald Sterling will appeal, his attorneys said. No surprise there. - Too much energy: These sleepy English bulldog pups just can't keep up with this fun-loving bull terrier. - Pint-sized percussionist: Watch this 3-year-old Russian boy tear up the drum kit with a brass band. Clap along! - Feline fantasy: Listen to this leopard purr with satisfaction as a zookeeper hits just the right spot. - Batkid documentary: Back in November, the world paused for a little boy with Leukemia to live his dream of becoming Batman. His story is now being told in a documentary: "Batkid Begins." - First impressions: This relationship between a baby elephant and a cat is a bit prickly at the start. Check out the body language from the pachyderm as it walks away. I am Black. I've been watching and watching. I've been listening and listening. I have not heard the voice. Where is the voice-the voice of the Christian, the believer? Where is the voice that says "Donald Sterling, I love you. Mr. Sterling I heard your words and you said how you feel. Allow me the opportunity to tell you about a Man who loves you so much that he died on a cross that the world and all mankind can forever be changed . Please, allow me the opportunity to tell you about Jesus and how much He loves you." Where is the voice? Where are the mega pastors who teach "Grace and forgiveness?" Where is the lone evangelist who claims "the call." Mr. Sterling may not accept Jesus. We can't compel but we love as Jesus loves. God does not condemn us so why do we condemn him? To whom do we offer Jesus if not to Donald Sterling? Are we so self-righteous, sinless, and bound that we turn from what we know is right when it is unpopular to be Christians. Could this all be because a former superstar is offended? Are Christians and the world so easily offended by words? Do we respond like the world? We should, as Americans, be appalled that in this great God guided country, founded on freedom, especially freedom of speech, a man is ostracized for his speech and preferences. That in The United States of America a man loses his property, his wealth, an even his freedom because of what some call "offensive speech." Who are these judgers who decide what is unpardonable? How can a country be so wrong? The great life we live hinges on our freedom to speak (not physically harming any person), freedom to choose our associations, and yes, freedom to even segregate ourselves and our lives from that which we choose. Freedom and civil rights take a hit but Christianity takes a much harder blow. It would be cool to see the kid rock with 2CELLOS. That 3y/o percussionist was phenomenal! Wow! Mesmerized by the gifted, talented three- year- old percussionist!!!!!!!! I just love Batkid Miles Scott!!!!!!!! What an amazing, brave little soul!!!!!!!! Could and will someone on the CNN team please tell me why my comments from yesterday, Monday, July 28, 2014 are still awaiting moderation? This has happen on several occurrences. I enjoy commenting on CNN NEW DAY. Thank you.